to the official ProFe homepage. 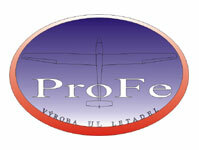 ProFe is a producer of UL planes and gliders. Copyright © by ProFe, 2007. Made by www.suchomel.org/NetSystems +S. All rights reserved.